My hearing problem is high frequency loss in combination with tinnitus. Dr. Kinn took the time to ask me to describe the problem to see if my explanation matched the test results. I really feel welcome when I go to HRC! 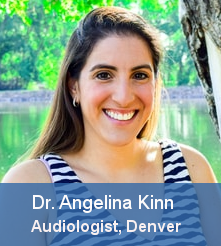 Dr. Angelina Kinn received her Doctor of Audiology (Au.D.) from Nova Southeastern University in 2012. Prior to this she completed her bachelor’s degree in Audiology and Speech Language Sciences at the University of Northern Colorado. She recently joined Hearing Rehab Center after completing the Audigy University Business and Leadership program. She has a variety of clinical experiences that include private practice audiology, ENT and hospital settings. She is certified by the American Speech Language Hearing Association (ASHA). She loves being an Audiologist because it gives her the opportunity to work closely with patients, and provides her the opportunity to help improve their quality of life through better hearing. Originally from Maryland, she is excited to be in Colorado and is looking forward to establishing herself in the Denver West community. Yvonne Clarke joined HRC in October of 2002, coming to us with 14 years of experience. Yvonne is a Colorado native and enjoys the beautiful Colorado outdoors and spending time with family.